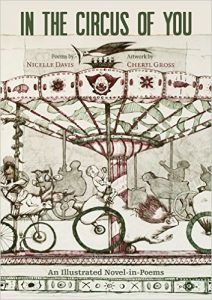 – Love, its promise and disillusionment, episodes of unexpected whimsy and deep despair, is masterfully orchestrated into a carnival of words and images in this distinctive collaborative effort by Nicelle Davis and Cheryl Gross. In the Circus of You bravely shares the disassembling of a marriage and the rebuilding of the self, the deconstruction of the familiar-turned awkward gestures of domestic routine, while it takes the reader on the path to a place of strengthened resolve, persistence, solace, and, ultimately, survival. Borrowing from the frightening visages and self-conscious discomfort in visiting a freak show, the poet and artist seamlessly intersect at each juncture of marital dissolution, revelation, and redemption. The reader moves cautiously through each of the four sections of poems as a visitor to a progression of sideshow stalls, witness to the sharp dissections of memory and confusion, and a contortionist’s skillful resistance against the pull of emotional instability. For all of its honest struggle and defiance, it is not pretty, but often gloriously grotesque—and its resultant pageantry (captured in both startling narration and drawings) is determined to fend off chaos. in air, without the treat [sic]of striking. Section II, “Recruiting Talent for the Appropriation Circus,” presents historic portraits of the deformed and dehumanized as the poet examines them within her own sense of alienation and affection for her freakishness, and empathy for these sad but spirited souls. It is an unsettling but touching homage that makes us wonder how vulnerable, peculiar, or fiercely loving we have to become to be considered truly human. The last two sections, “The Clown Act” and “Beyond the Three Rings is the Circus My Selves Dream of” help to slow the strains and spin of the calliope and bring us back to equilibrium, to the self reconstructed, and a mother’s unobstructed love. 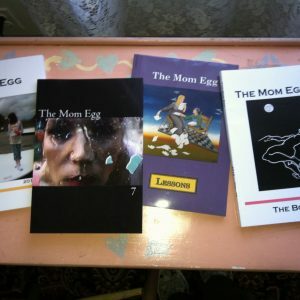 Mindy Kronenberg is an award winning poet, writer, and critic with over 450 publication credits world-wide. 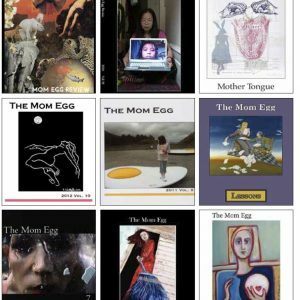 She teaches writing, literature, and arts subjects at SUNY Empire State College, edits Book/Mark Quarterly Review, and is the author of Dismantling the Playground (Birnham Wood) and Images of America: Miller Place (Arcadia). Next Article The Best Small Fictions 2015, Tara L. Masih and Robert Olen Butler, Eds.